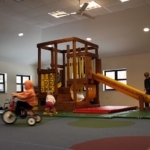 Our indoor spaces provide ample opportunity for children to play, explore, discover and learn. 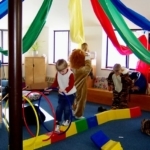 Dramatic Play Center with props and costumes that promote creative pretend play, role playing and social interaction. Library and Writing Area stocked with books, puppets and writing materials to reinforce language development. 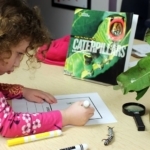 Children look at books, hear and retell stories and dictate their ideas to the teachers. They are also encouraged to write and employ a combination of symbols, letters and invented spellings. Fine motor development is encouraged through the use of materials like scissors, markers and rubber stamps. Math and Perceptual Area with puzzles, games and manipulatives that promote mathematical and spatial reasoning. Block Areas are spacious and supplied with an extensive collection of unit blocks, large hollow blocks and other building materials for a wide variety of creative construction. Sensory Table that provides daily opportunities for open-ended exploration with materials including clay, modeling dough, water, mud and shaving cream. Science Area containing interesting books and natural items that stimulate children’s curiosity. They are enhanced with tools like magnifying glasses, scales, and rulers to promote observation, prediction and recording. Sand Room is a solarium adjacent to both classrooms that houses a unique indoor sandbox . 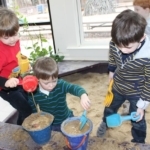 The room-sized sandbox offers children oportunities for year-round sensory exploration, socialization and dramatic play as they dig, sculpt and construct together. Art Area promotes self-expression and exposure to a wide variety of mediums and techniques. 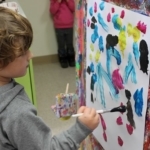 Projects may relate to the classroom theme or children are free to use the paint easel and explore various materials to create their own works of art. Music and Movement Room often referred to as the “Big Room,” provides a bright, carpeted indoor space for gross motor activities, physical games and creative movement. This room houses balls, large foam building blocks, indoor pedal vehicles and a large climbing structure. During regular enrichment sessions with music and movement experts, the children dance, sing and play instruments in a comfortable setting.